The Details Events was thrilled to partner with Participate and The Carolina Inn to throw a big end of year bash for employees, friends and supports of Participate and alumni. The evening was three parts. The first was cocktail hour. Guests arrived to a surprise "step and repeat" logo banner and a stunning Red Carpet Lady! As they made their way down the hall to the ballroom, a Champagne Dress entertainer was there with unlimited glasses of champagne. In the ballroom there was full bar service and spectacular appetizers. The company displayed the different logos throughout the years in the room. A photobooth was ready to go for guests that wanted to document the evening! After cocktails, guests were invited to the Hill Ballroom for dinner and presentations. The founders and other key staff persons presented both humble and funny material throughout the meal. During dinner the Chancellor Ballroom was transformed into an after party lounge. A huge funky band played well into the evening and guests either hit the dance floor or enjoyed the lounge alcoves created. The bar was stocked and late night bites were served. It isn't often that a company takes time to really pause and look around at how far they have come and to celebrate it. The Details Events was honored to be able to manage this event so they could do just that. 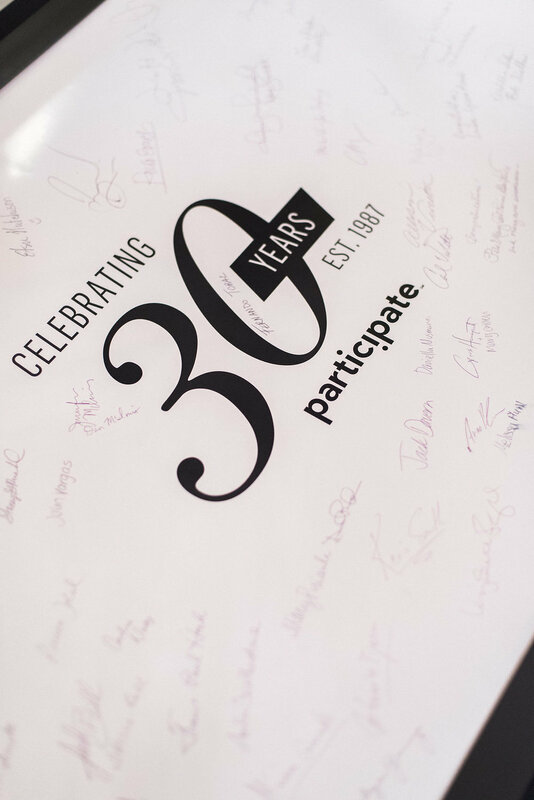 Cheers to another 30 years and beyond, Participate! We appreciate the work you do!